Countdown to Brain Age 2: More Training in Minutes a Day! Time until Brain Age 2: More Training in Minutes a Day! release day! Learn more about Brain Age 2: More Training in Minutes a Day! 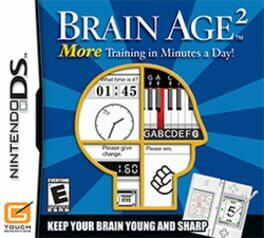 Brain Age 2: More Training in Minutes a Day contains all-new activities to challenge a player's gray matter. The title is a series of trainings designed to give the brain a workout. The 17 new, engaging activities are all designed to help work the brain. Whether players are playing simple songs on a piano keyboard or monitoring the photo finish of a footrace, they'll love this new mental workout.